During a recent Page One Lunch & Learn Jeremy, our amazing Production Manager, shed some light with the P1WS Team about WordPress Plugins - which ones to use for what issues and some basic plugins used with every site we develop. We thought this information was so helpful in getting us up to speed, we wanted to share with you! What is a WordPress Plugin, you ask? Plugins give your WordPress website added functionality that the base install doesn’t offer. Problem: I’m getting too much spam in my blog! Plugin Solution: Akismet analyzes a massive amount of data in real time to determine spam comments and helps protect your website and save you time managing all that junk. Problem: I need a contact form for my website but how do I know which plugin is best? Plugin Solution: Contact Form 7 is our pick! With this plugin you can manage multiple contact forms (so if you have different departments likes Sales and Customer Service), plus the form is customizable and supports CAPTCHA and Akismet (say no to spam!). Problem: I’m getting too much spam in my contact forms! Plugin Solution: Contact Form 7’s Really Simple CAPTCHA; they go together like peanut butter and jelly! Though originally made to work with Contact Form 7, if you’re already using another plugin for contact forms you can still use this CAPTCHA to protect your website from spam. Problem: Our website contact form submissions get emailed to various email addresses, is there a way I can see the submissions all in one place? Plugin Solution: Contact Form DB will save all your contact form submissions in one database in the administration area on WordPress saving you tons of time sorting through emails. Problem: My website got hacked, is there a plugin to increase security? Plugin Solution: Wordfence not only helps keep your website secure it also helps improve your website speed. Fist bump! This plugin will filter live traffic to prevent your site from being hacked, block potential threats, and help your website recover if your site does get hacked. Problem: How do I make sure the pages on my website are optimized for search engines? Plugin Solution: Yoast WordPress SEO is the most helpful on page SEO plugin we’ve found. Not only does it help you learn how to write better content but it also analyzes your pages and offers specific instruction on how to improve optimization. Added Bonus! This tool also automatically generates XML sitemaps that make it easy for you to submit to Google and keeps your site code clean and lean. Problem: I use a lot of images on my website but I notice it slows my site down, is there a plugin that will help? Plugin Solution: WP Smush.it plugin uses an API that reduces an image’s file size by optimizing image compressoin and converting GIFs to PNGs automatically. There you have it folks, WordPress plugins demystified. 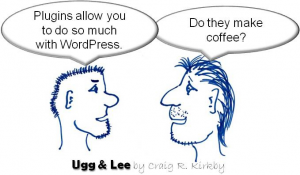 Since WordPress is always evolving so are its plugins. Some of these listed here may not be the best of the best in six months from now. But we’ll do our best to keep you updated in the future, but in the meantime, if you have any questions, feel free to use the comments below and we’ll do our best to respond in a timely manner.